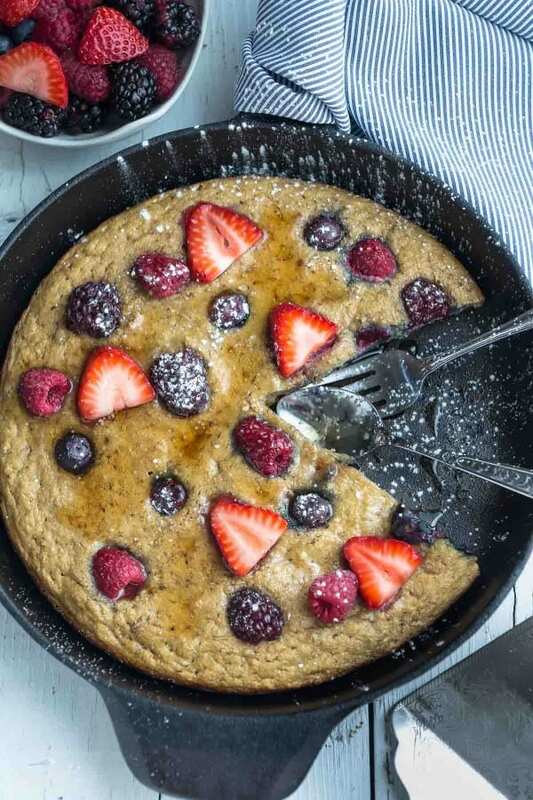 Baked Coconut Flour Berry Skillet Pancake – soft and fluffy pancakes that are healthy grain free, paleo friendly and refined sugar free. 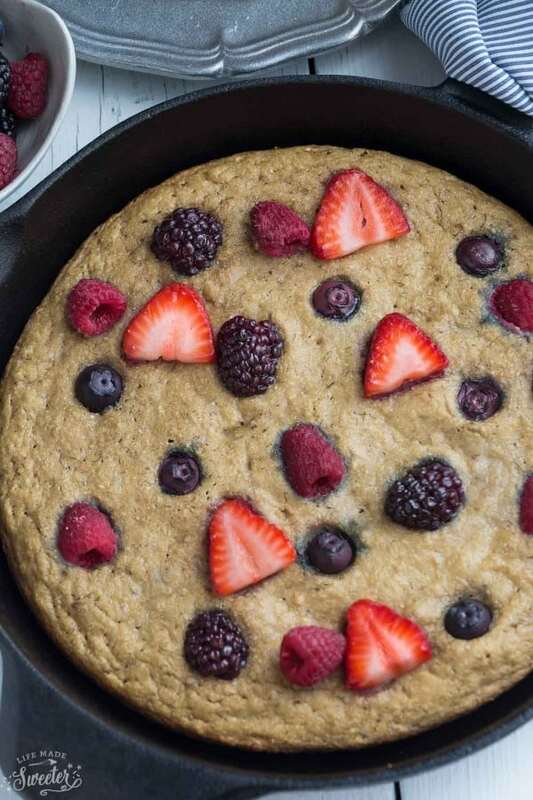 Bursting with fresh berries, it’s the perfect healthy breakfast! If there’s one meal my family gets equally excited about, it’s breakfast…..especially when it involves pancakes. I am always on a never ending quest to find the perfect fluffy pancake. This is the base recipe I usually use but over the years, I’ve been trying to come up with a healthier and paleo version that my family will love just as much as our standby recipe. And after what seemed like a bazillion failed attempts, I finally made a batch that my family could get just as excited about. 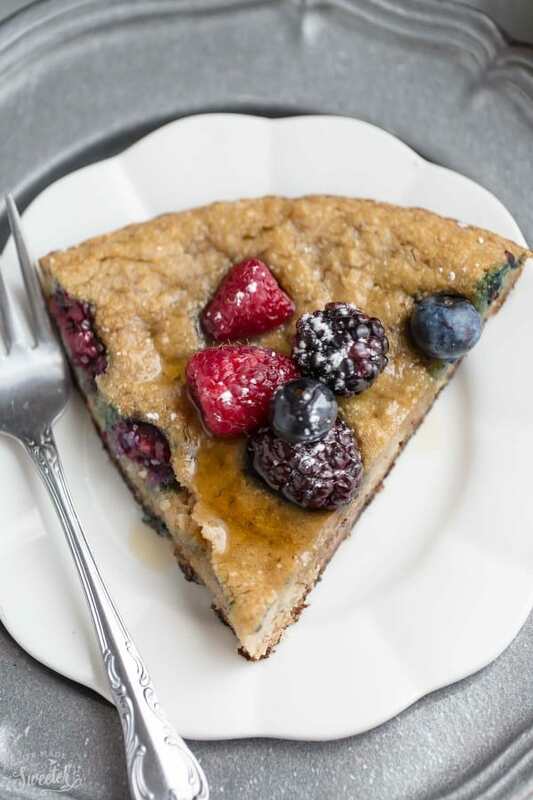 This recipe starts off with Hodgson Mill’s Coconut Flour. 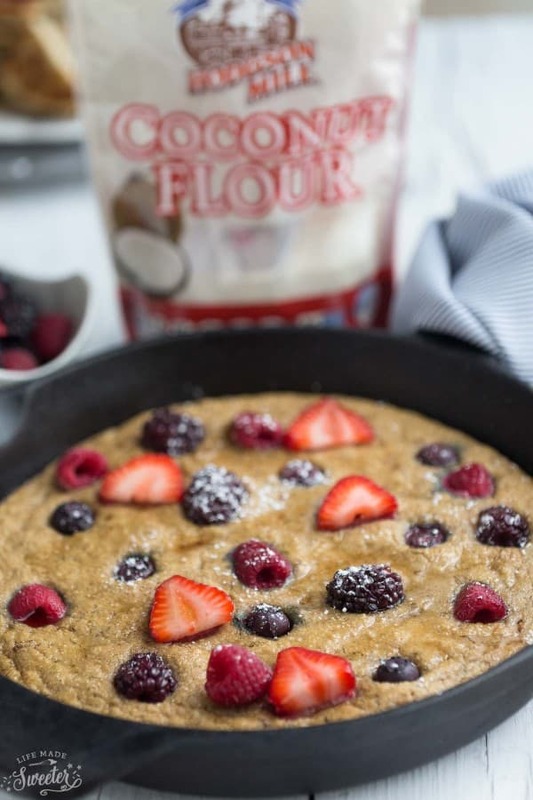 I am a fan of using coconut flour for a lot of my gluten free baking and it’s nice to know that I can always count on the great quality I’m getting from Hodgson Mill. It’s grain free, paleo friendly, high in fiber, low in carbs and helps to keep cakes nice and soft. 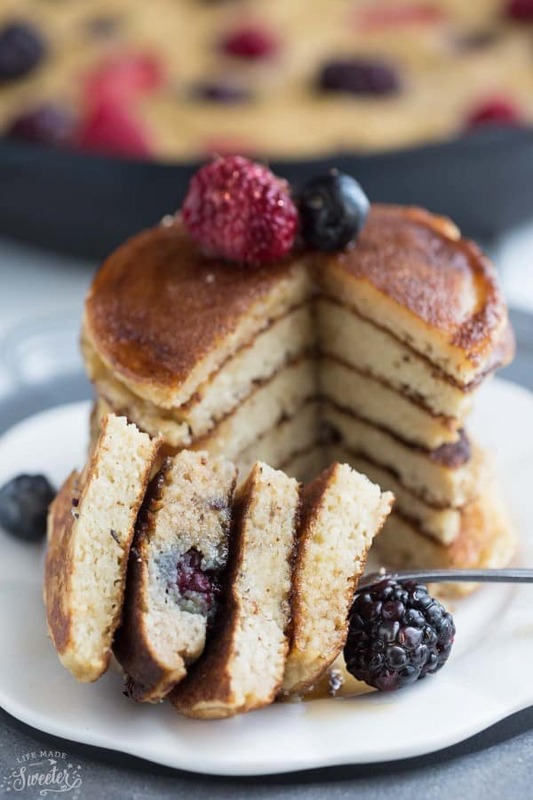 All it takes is just a little bit and you can see how soft, fluffy and delicious these pancakes turned out. Plus they’re full of protein and have no refined sugar added. Instead, I mashed up a really ripe banana and sprinkled on some fresh sweet berries. We thought it was sweet enough but you can totally add some maple syrup if you’d like. My kids loved them so much that I had to make another batch for them. But I can be so lazy sometimes and rather than flipping another pile of pancakes, I poured the pancake batter into a 6″ cast iron skillet and baked it in the oven to make one giant pancake instead. Just cut into wedges and serve plain, with your favorite fruit compote, maple syrup or a sprinkle of powdered sugar. 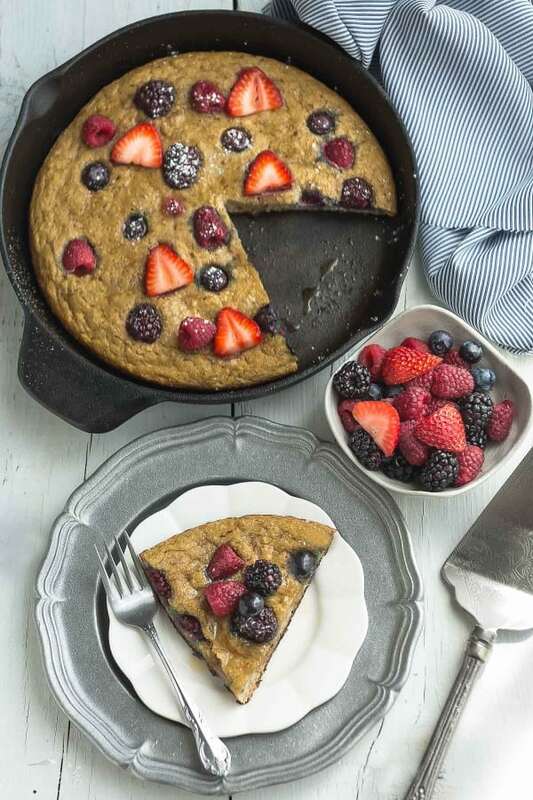 This would be perfect for sharing on your Memorial Day long weekend with all the pretty berries. Plus, since it’s gluten free, you won’t have that heavier feeling you usually get after consuming too many pancakes. So simple and delicious – breakfast just doesn’t get any easier! In a large bowl, whisk together the coconut flour, baking soda, salt and cinnamon; set aside. In a separate large bowl, mash the ripe banana using your fork and measure out 2 tablespoons. Beat in eggs, one by one until frothy and combined. Add vanilla, maple syrup and milk and beat until combined. Slowly pour wet ingredients into the flour mixture and stir until combined and smooth. Do not over-mix. Batter should be thick but not almond paste like. Batter thickens up more the longer it sits. Add more milk, 1 tablespoon at a time, as needed to thin out the batter. Preheat oven to 350 degrees. Grease 6" inch cast-iron skillet with coconut oil. Pour batter into skillet. Press berries evenly throughout the batter. Bake in preheated oven for 17-22 minutes, or until pancake is cooked through. Remove from oven and allow to cool for 5 minutes in the pan. Drizzle with maple syrup or favorite toppings as desired. Preheat a griddle or pan over medium low heat. Grease with coconut oil. Once pan is hot, scoop about 3 tablespoons of batter onto preheated griddle. 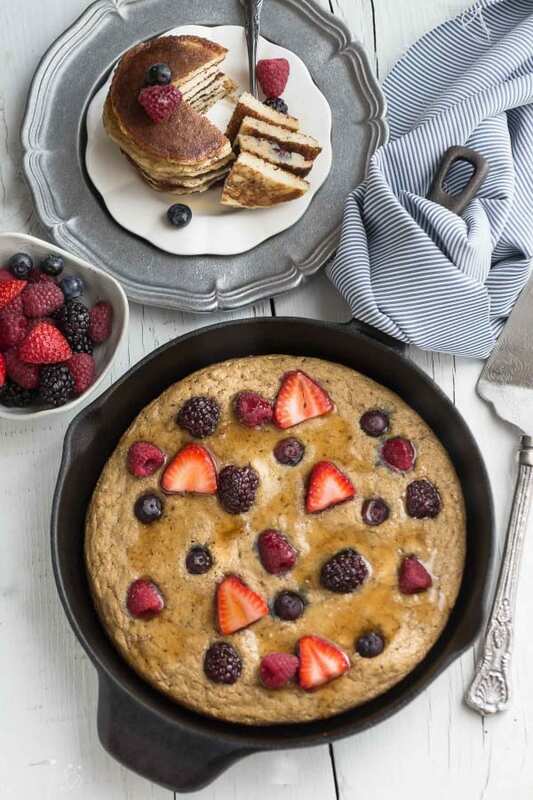 Press a few berries evenly on each pancake. Cook undisturbed until bubbles form around the edges (about 4-5 minutes depending on your stove and the batter). Using a spatula, gently flip pancake and cook for an additional 1-2 minutes. Transfer to plate and repeat with remaining batter. Serve with maple syrup or favorite toppings as desired. Feel free to add the optional maple syrup to the batter if you prefer your pancakes sweeter. DISCLAIMER: This is a sponsored post created in an ongoing compensated ambassadorship with Hodgson Mill. All opinions are 100% my own.